We all have a dream!! "BRU"
...We all have a dream!! "BRU"
Bru Jne...Bru Dolls Within an hour after purchasing my first reference book about antique dolls I had discovered an incredible face with large almond-shaped eyes, soft, expressive lips and a haughty overall presence. Bru. Three little letters which represented the ultimate dream. The quintessential image which haunts all dedicated collectors of beauty. Bru Jne & Cie...circa 1866-1899. Paris and Montreuil-sous-Bois, France. The Bru doll line included bebes with stable bodies of kid. Dressed and undressed dolls. Wood jointed and wood carving. A bebe in hard India rubber. The bebe with the pursed mouth, Bebe Teteur. Bisque arms and hands shaped delicately to form an inward palm with gracefully bent fingers. In all honesty, the kid body on a Bru does seem a bit small on some of the dolls, and the arms give it a simian appearance. The doll marked with a circle dot...bears these characteristics...but overall none can compare to her beauty. .Bru also sold bisque heads either as replacements for those that had been broken or for a body that a mother had lovingly created. Would you really pass up a Bru doll if it was on a body of the same age but not marked as such? By 1883 the firm of Bru Jne & Cie was passed on to H. Chevrot. The name Bru remained. Many gold medals were won by the Bru firm at exhibitions throughout Europe circa 1885 through 1889. Ahead of their time, some Bru dolls threw kisses when a string was pulled. Some were advertised as "walking and talking". There was a "ma-ma, pa-pa" doll. The acquisition of a Bru Jne many, many years after the discovery of her image in my first reference book should have been the realization of a coveted dream. Surrounded by sadness and deception, the dream became unresolved...the Bru became insignificant. As we search for old dolls, we search for the love and joy that they once brought to a youthful soul. We restore them to what we thought was their former beauty and treasure them as if we were the original owners. We dream of the dolls we long for...though they may be out of our range of acquisition...we all have a dream. Perhaps we should embrace the excitement of that dream... as the realization may not bear the rewards that the dream has provided all along. Probably the best place to look for a present "doll and accessories" value is on the Internet, primarily the auction sites--my favorite is eBay...in the completed Bru Dolls section of eBay is where you can browse the past 30 days of completed auctions of Bru dolls and accessories. On the left side, in the box named "Display," you can select "Active Items" to see the "Bru dolls and accessories" presently up for auction. 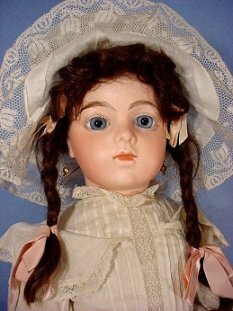 eBay has a rather large set of listings of vintage Bru dolls for sale, if you are interested in a purchase, or to find values if looking for costs, it is necessary to register with eBay. Also, if you have a doll or doll accessories you would like to find out about...eBay is the place to start. In the Dolls and Bears Category just type in what you have in the search window just under "Dolls & Bears" on the left, and "Shazam", there appears a list of present, up for auction items--in the "Display" box on the left select "Completed Items", a new list will appear, displaying completed items going back for 30 days. Welcome to "Show and Tell" for early Bru Jne Dolls! "Show and Tell" your favorite Bru Doll. We all have an interest in how they were located, the use of materials in their clothing and anything else you would like to share with other avid collectors.